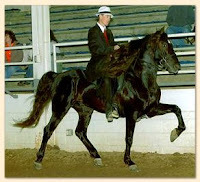 The Tennessee Walking Horse (TWH) was bred for his endurance, docile temperament and his extraordinarily smooth ride - absolutely no bouncy-bouncy. Developed by middle Tennessee plantation owners in the 19th century, the horse could travel at high speeds between rows of cotton and tobacco without damaging the crops. In those days he was referred to as a Turn Row or Plantation Walking Horse . The beauty of the TWH - besides his gentle nature and good looks - lies in the three gaits. He is best known for his running walk which can reach speeds of 10 to 20 miles per hour - and with no bouncy-bouncy. The horse glides; he does not trot. Now known as the Plantation Walking Horse, he is used for endurance competitions, trail rides, and by mounted police and outfitters. He is also used for show. One of my favorite divisions is the Champagne Class where the owners set out to prove they have the smoothest horse in the world. At the end of the class, whoever has the most Champagne left in their plastic wine glass wins and they get to drink the rest. Well, so does everyone else actually. The flat-shod natural gaited and naturally trained horse is the true Tennessee Walking Horse – no matter what he's called. There’s a saying that’s been around for awhile: you can ride all day and dance all night. So true. I had four of them and you can’t find a sweeter breed or a smoother ride. Don't be puzzled by the head nod. You want a nodding fool because it indicates a longer stride which means a smoother ride. This is a perfect example of a flat-shod Tennessee Walker. Remember: Natural. Frodo, a Son of the South, shares your appreciation for both the artistry and the nuance of trainer and subject. What makes the "champagne" performances so special to Frodo, is that they are, as a general sort of rule, illegal. "Dry counties," eh what? That's what I love about the South, hypocrisy with a twist! Frodo: I don't think there's such a thing as a dry county in Colorado. Here they probably use grape juice - white. I see why you love these horses Leslie. Truly beautiful! I have never in my life been on a horse, I think at my age I would be afraid! Not on a walker. Young, young kids and old farts like me can ride them. Of course I'd have to have a mounting block to get on him. The first and only time I have ridden a horse was 35 years ago, and if I ever get on another it would have to be a Tennessee Walking Horse after watching the video. Nice story. That certainly does look like a very smooth ride, and probably safer than a Toyota:-) The head-nod is kind of surprising. I see what you mean about it being part of the gait, but I'm surprised the horse doesn't get tired of it. I've never ridden a horse, though I have ridden a camel (more than 30 years ago), and I was thrown by a particularly vicious bicycle last year. The rhythmic head nod is a trait unique to the TWH. It seems so natural (key word here) that I've never thought about the horse getting tired of it. The less he nods the less he has a proper walk. You can compare with the horses in Part 2. I've hear camels aren't too comfortable. Anyway, they're too high off the ground for me. There is something about the graceful, controlled movement of the "gaited" horse that captures your attention and the TWH is right up there for grace and beauty. I also enjoy watching the Paso Fino, but they are generally a little smaller and can lack the sense of majesty of the TWH. Rocky: True about the Paso Fino. A friend of mine switched to them because they can actually be even smoother. Another very pretty gaited horse is the Kentucky Mountain Horse. Smaller but very often black with a flaxen mane. Had to look up the Kentucky horse and I believe I've known those horses as the Spotted Mountain Horse. Seems they were called that due to their frequently dappled coloring. Still think the Tenn Walker is the flashiest. Part 2 of my little story is going to be on the Big Lick horse and industry. I look forward to part two. I have not owned horses in many, many years and don't ride any more but still have a vast fondness for horses. When I was growing up, my sister had a Tennessee Walker. He was a magnificent animal. Very nice! Smoother than a '58 caddy. They are wonderful horses. Rocky: I like your kind of trouble making. I'm afraid Part 2 will not be so pretty. In fact I'm having sort of a tough time writing it. TC & Bee: They are magnificent. I always said they're like driving down a super smooth highway in a big ole Lincoln Continental. 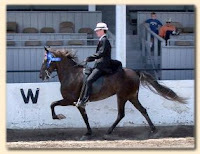 IF you want to see the best naturally gaited Tennessee Walking Horses in the U.S., come to the North American Pleasure Gaited Horse Championships, Missouri State Fairgrounds, in Sedalia, MO, Oct 14-16, 2010. More info at www.NAGHC.com. No pads, chains, long toes, or heavy shoes. Some are barefoot. They are very smooth, very natural, and very beautiful. Thank you Leslie, I love the video too. Gracie is beautiful and a perfect name for her. They really are beautiful horses. Too bad so many are mistreated just for show. See Part 2.